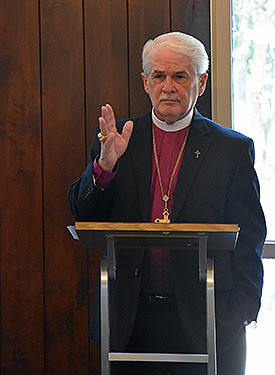 In a meeting today at the Diocesan Center for Ministry, Bishop Jack L. Iker announced to the diocesan clergy his intention to retire at the end of 2019. With the diocesan Standing Committee, the Bishop is calling for the election of his successor, who will become the fourth Bishop of the Diocese. Consecrated on April 24, 1993, Bishop Iker succeeded the Rt. Rev. Clarence Pope, becoming the third Bishop of Fort Worth on Jan. 1, 1995. He will celebrate the 44th anniversary of his ordination to the sacred priesthood on Friday, Nov. 9, at the Opening Eucharist of the 36th Annual Diocesan Convention. A Nominating Committee for the selection of a slate of candidates is to be formed in October. Provisions for the process are set forth in diocesan Canon 40, which calls for two representatives (one lay, one clerical) to be elected from each of the six Deaneries. Eight additional members (four lay, four clerical) will be elected by the Executive Council, and the Standing Committee will elect a further eight committee members (four lay, four clerical) and a chairman. The Nominating Committee is expected to make a report to the Convention in November. The election will take place at a Special Convention on June 1, 2019; the consecration date is tentatively set for Sept. 21, the feast of St. Matthew. Following is a letter to the Diocese from Bishop Iker. As we move forward together in the months ahead, we are confident of God’s grace and guidance as things unfold. Thank you for your prayerful support of this process, that it may be led by the Holy Spirit.